Pro Challenge cars are 3/4–scale race machines with 4/4-scale drivers racing them at 4/4-scale tracks like Bristol Motor Speedway and Hickory Motor Speedway. And while two out of three of those scales are the norm, this weekend Zach Stroupe will make his Pro Challenge debut and he currently fits right into the series mold. The 12-year-old racing phenom could be considered ¾-scale himself as far as his size, yet his proven track record in both a Bandolero and Legends car competition puts Stroupe at a 4/4-scale level when it comes to talent. 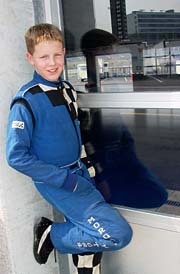 With Stroupe’s 13th birthday coming up on October 28th, a trophy from the race would be a very welcome birthday gift. “Yeah, that would be a cool present,” said the smiling young man. 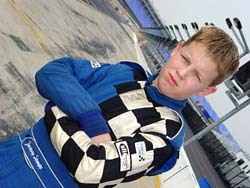 Watch for 12-year-old Zach Stroupe as he makes a name for himself on short tracks throughout the Southeast and stay tuned for the launch of the all-new www.zachstroupe.com coming soon. Stroupe made the step up to a Legends car earlier this season with a limited slate of races and turned a few heads with his performances. Stroupe is fresh off a successful test at Hickory, where he got into a Pro Challenge car for the first time ever, and set the quickest time in the session that featured a number of series regulars. John Freeman practices his #57 at Bristol last week.